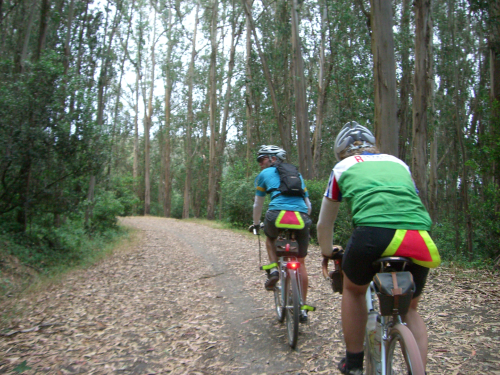 A Dart is a randonneuring team event with minimum distance of 200k that has to be covered in exactly 13:30 hours. All teams converge on a common finish location and share a meal. "I don't give $@!7 how you're feeling, you're f&*#&@$ riding... who else is gonna provide the fart soundtrack to the adventure?" That was my response to John's lame attempt to wimp out of the Dart. So what, it was going to be hot, somewhere around 95F° on the warmest areas of the San Francisco East Bay. I'll be fun! With my BART ticket in hand I left home at 6am Saturday morning. John and I where meeting at the station but he caught up with me a few blocks away from it. The ride to our start location was uneventful except a drunken homeless guy annoying everybody on the train. Gabe was also getting off the train; we rode together to the start of our route, the Safeway at 63rd Ave and College Ave in Berkeley. Within a few minutes Bryan arrived and while I was inside getting some Ensure, Theresa came. With the Ensure distributed among us we started pretty much on time at 7:00am. I was serving as paper Captain for the team, El Rey Sordo y sus Audifonos, but the route was all Bryan's, the East Bay is his domain. As per John, I am El Rey Sordo (The Deaf King). We climbed on pavement and then got to the first fire road section of the day and also the first informational control. West Ridge Trail was really nice, the right balance of level ground, rollers and frequent turns. Temperature was pleasant but raising fast. 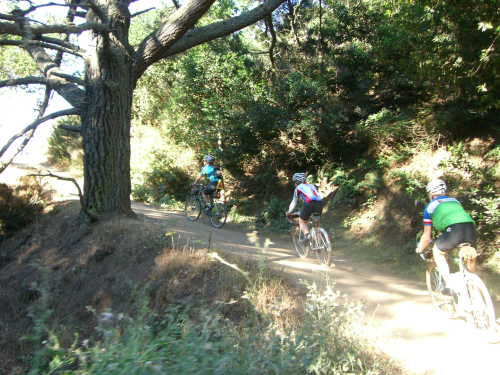 The fun went on for a while but eventualy we had to go back into paved roads and reach the next control in Castro Valley. Our bikes were well covered in dust now. After a quick stop for a pastry and then ice we moved. Hot, no other way to describe it. It was only 11am and the heat was already unbearable. As we moved to the next control in San Ramon and then start climbing Mt Diablo we were about 15 minutes ahead of schedule. Form my previous experience with mixed terrain Randonneuring routes I knew that was not enough padding against mechanicals or exhaustion. I had never climb Mt Diablo, just drove up to the top once more than 20 years ago! This was all new to me. We were gong to climb just about half on the South Gate paved road before descending on fire roads. The team broke up on the hill. Bryan and John climbed mostly together, I followed them closely and Theresa riding a little behind me. I could not see Gabe. Near the next control on the middle on the climb, my bike computer registered almost 45C° or 113F° (don't ask me why my computer does not register temperature in Fahrenheit degrees) lets say it was only 112F°. When I got to the Informational Control Bryan handed me the receipt. When Theresa arrived we continued climbing to the promised land. Restrooms with running water. Using my coolmax skull hat I poured cold water all over my overheated body. It was then I realized how tired I was. We sat on a picnic table near the restroom ans waited for Gabe. After a little while Bryan received a txt from Gabe "DNF". We did not know if he was coming up the hill or if he had gone down the same way we came. Slowly we started getting ready to move on when we saw him. He was not looking good. I parked his bike while others pour water over his head. After Gabe had rested we moved on. A little more climbing before we started the fire road descend. Some up and some down but mostly down from about 2000ft Descending on the dusty fire road felt like having a huge hair dryer pointed to the body. Bryan would lead the group and we regroup at every intersection. Near the end of this section Theresa's rear fender broke; the bolt on the top, pulled trough completely. I think it was also here John asked for some of my black duck tape to fix an issu he was having with the front bag. I had brought my regular tool kit which has a good amount of supplies and tools to repair many road side mechanicals and then some. I had a few zip ties we could use for Theresa's fender. After Theresa MacGyvered her fender, I noticed the tire would rub the zip ties, barely but it would rub. Pavement was close so we moved on and hoped for the best. Our lunch location at Safeway in Walnut Creek was not a control but it was all flat to there. Safeway was fairly busy but we managed to get a couple of tables next to the Starsucks franchise. One by one we went to buy our lunch. I went for sushi, hey Masa one of our Japanese SFR riders, usually has that for lunch on the Safeways we stop at during regular brevets. It is god for Masa, it most be good for me. I was surprised it was ok. Gabe and John were done for the day. Theresa was on the fence between continuing or calling it a day. After finishing all food and drinks we moved the party outside where it was now "only" about 110F. Time for Theresa to figure what she was going to do about her fender. After debating the choices the broken rear fender came off and was promptly destroyed. We were good to go. Crap it was hot! John and Gabe headed to BART while Theresa, Bryan and I continued our day on the bike. We were now more than 1 hour behind schedule. It was not looking good as we had plenty of climbing ahead of us, some of that near the end. The hills on this next section had me slowing down with cramps. No mater how much I had been drinking from the start, my legs were having a hard time on some of the hills. As soon as we got to the next control in Crockett I went looking for a V8. Safeway does not sell single V8s (at least not to my knowledge) and I had been craving that for a while. V8, an ice cream sandwich and a Gatorade. We ate and rest at a park down the street. Now temps were a low 85F° or so. After the food and rest I felt much better. Still we were a little over an hour late as per my estimates. It was mostly flat to the next control. We saw another Dart team, they had started in Davis and were almost done, we still had plenty of hills and miles ahead of us. 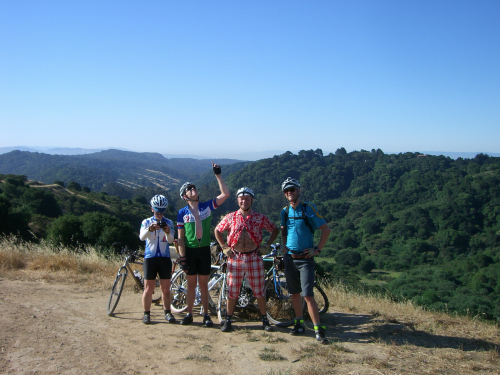 The stop at the Pinole control was short but did not made a dent on our time deficit. 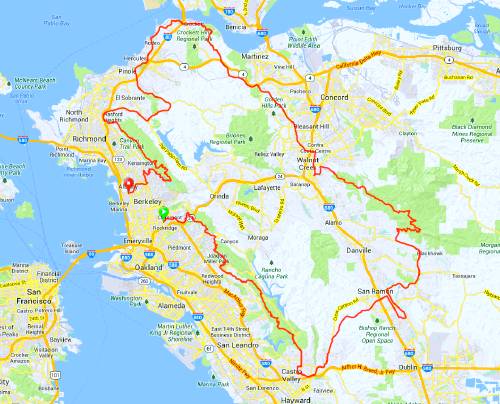 It was decision time, continue on the route or cut the next control in Orinda and then rejoin the route in El Sobrante. We were one of the last teams scheduled to finish at 8:30. If we sticked to the route, at our current pace, we probably would be finishing somewhere between 9:30 to 9:50pm. Would there be volunteers waiting for us and more important, would there be any food for us? 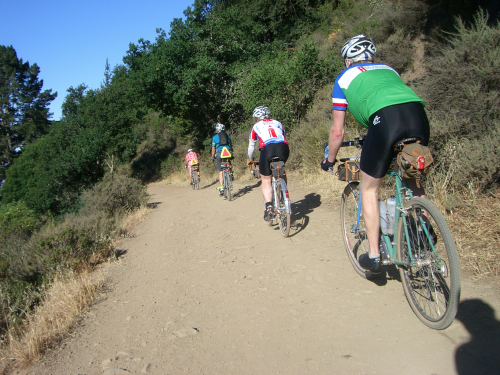 We decided to play it safe and cut the ride short by about 10 miles by chopping the Orinda control. It was a hard decision, one I wish we have not done but it was the correct thing to do. 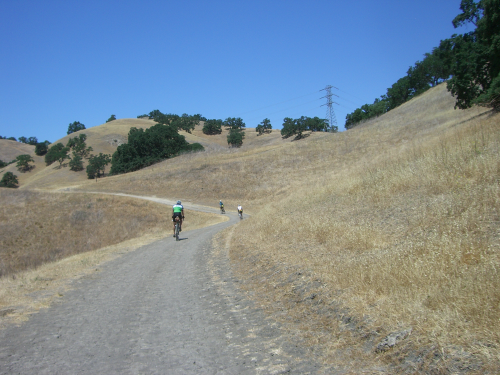 After rejoining the route in El Sobrante we turned up towards Wildcat Canyon. The busy streets turned into quiet fire roads and the temperature dropped dramatically. Thick fog cooled things down a lot, after being hot al day it was time to wear a vest and toe warmers. Very few people on the trails. My cramps were history and I was feeling much better now. After about 5-6 miles of fire roads we were back on pavement and it was all downhill from here, really. We did a ride-by at the next information control, then a last stop less than 2 miles for one more informational control and the final miles to the finish at T-Rex. My rear wheel was feeling weird on the turns but we were so close to the finish I just ignore it. Got to the finish at 8:00, half and hour earlier than our scheduled finish but also 10 miles shorter. Volunteers greeted us and help us park the bikes. A rested John and Juliayn where there. It was time to eat. Not so fast, most tables where taken and the empty ones had plenty of leftover dirty dishes on them. We grabbed a table with not so many dirty dishes on them and waited, and then waited some more for food. Gabe arrived and a little later Bryan's girlfriend. I went to chat with other riders and when I returned to the table a plate with ribbs was waiting. Cold ribbs. Waited more to get our drinks order. Gabe and Bryan had ordered salads, they took a while to come. We asked for more food but it never came. I give T-Rex a D for service and food. Cold ribs, seriously? I was surprised we had to pay for the drinks but no big deal. Me no going back there again. By the time we were ready to go it was about 9:20pm. Volunteers where there till 9:30 so I was glad we had decided to cut our ride short. Juliayn, John, Gabe and I rode to BART. I made it home by 10:30pm on an almost flat tire and still hungry. Fortunately there was pizza waiting for me. Nice team event, great team, great San Francisco Randonneurs (SFR) organization... all marred by T-Rex poor food and service at the end. Hope we, SFR, pick a different ending location for the next Dart, I vote for A park in San Francisco or elsewhere in the city.